Patti wrote: After reading through this thread, I think another there's another skill requirement of a good 'elemental' palm reader - math. Maths was one of my favourite subjects at school! In face-to-face readings, I can tell at a glance if it is an archetypal handshape. If it's some fire combination hand (eg the fingers look a bit longer than standard fire, or the palm looks a bit narrower/wider), it depends on time factor. I might measure the hand print with a ruler. Or just roughly measure it against my own hand or guage the proportions using my pen as a measuring tool! Or I might not even bother with handshape. Fire combination is so common in UK & handshape is only a general indication of how they express their energy out. So I don't spend much time talking about it unless it is an obvious archetypal handshape. Exactly my thoughts when I was asked to present a "typical water hand" / "air hand" etc in this thread! I hope you understand now why I was reluctant! Talking about an 'earth person' is a simple way of saying someone who has dominant earth characteristics in their personality, however that is caused/manifested in their hands. Someone who is secure, stable, boring, dull, predictable, home oriented is 'earthy', as is a miner who lives in a small village in a rural area and grows their own vegetables. But they would be 'earthy' in a different way - and the hand features that reveal that earthiness would be different. In my new 'finger length' project I have tried to make a connection with the elemental hand shapes - e.g. via guidelines + examples for the 4 hand shapes that are presented in the books presented by Johnny Fincham, Jennifer Hirsch and Fred Gettings. The picture below is the (early) result that I want to share - but I will share my thoughts & observations later. Fascinating stuff... basically, the authors appear to present each their own guidelines for recognizing each of the 4 hand shapes. But their examples together tell a story on it's own: because the examples for each hand shape turn out to be grouped in a way that is actually a bit surprising....! sorry, it's late here so I am too to check it out. will reply tomorrow. - Earth hand shape is typically featured with a palm shape characterized by a relatively WIDE palm breadth (because finger length is only short relative to the palm breadth... but not in the perspective of the palm length). - Air hand shape is typically featured with a palm shape characterized by a relatively SHORT palm length (because finger length is only long relative to the palm length... but not in the perspective of the palm breadth). So, this implicates a very significant difference in palm shape between the Earth hand shape and Air hand shape! - Water hand shape is featured with a palm shape characterized by a relatively NARROW palm breadth (because finger length is only long relative to the palm breadth... but not in the perspective of the palm length!). - Fire hand shape is featured with a palm shape characterized by a relatively LONG palm length (because finger length is only short relative to the palm length... but not in the perspective of the palm breadth!). PS. Fincham mentiones that the characteristics of the lines also a play a significant role for recognizing hand shape type... who knows, maybe there is even a correlation between the type of lines and this alternative proposal for recognizing elemental hand shape. By the way, in Johnny's book I found a few clues (for air hands + fire hand only) which sort of directly CONFIRM these alternative (more specified) descriptions. And maybe it some later stage it would become interesting for Jennifer and Johnny to participate in further discussion about these matters, etc. Measure middle finger & length of the palm from base of middle finger to top crease at the wrist. If finger is 85% or more of the length of the palm, fingers are long. 80% is medium fingers, 75% is short. No, there is no "ether" hand. Just earth, water, fire, air and their combinations. How would these new comparisons fit in the above percentages. Would it be possible Martijn to create a graph with Lynn's measurements for the elemental system and place the 3 participants you have chosen on it along with your averages? Yes Patti, that is one of the next steps that I have in mind. By the way, Johnny is using sort of the same percentages that Lynn mentioned - though where Lynn mentioned 85%, Johnny is using 'seven-eighths the length of the palm' which would make 87.5%. Johnny is also using the 75%. This implicates that Johnny's 87.5% is just above the horizontal dotted line at 0.87 in the picture (see the vertical scale), while Lynn's 85% is positioned at a larger distance below that line. There are other points that I have in mind, but first I would like to see whether my proposal for making a specification regarding 4 different 'palm shapes' could potentially make sense for Lynn. So, before presenting another picture I prefer to wait and see what Lynn's thoughts are regarding my picture. Lynn wrote: Yes I "sort of" understand Maybe I should take more notice of finger length vs palm width in all hands, not just borderline/combination ones. PS. Patti, I am hopeful that Lynn will understand the relevance of putting more value on the aspect of 'palm width', because earlier in this discussion she already mentioned that she is willing to consider that as an option (see above). breadth... but not in the perspective of the palm length). Martijn, I don't understand this conclusion about "finger length is only short relative to the palm breadth". In 5 element system we look at finger length compared to palm length. E3 in the diagram would not be an earth hand, as the fingers are more than 80% the length of the palm. Yes Lynn... I fully understand your problem here. However, for the moment I think we can focus on the fact that Gettings presented that hand as an example of an 'earth hand'. Now, however, instead of focusing on any of the 12 specific examples in my picture, I would like to ask you to focuss your attention first on the three 'earth hand' examples together: out of the 12 hands those three are positioned closest to the zone 'short finger + earth hand shape'. 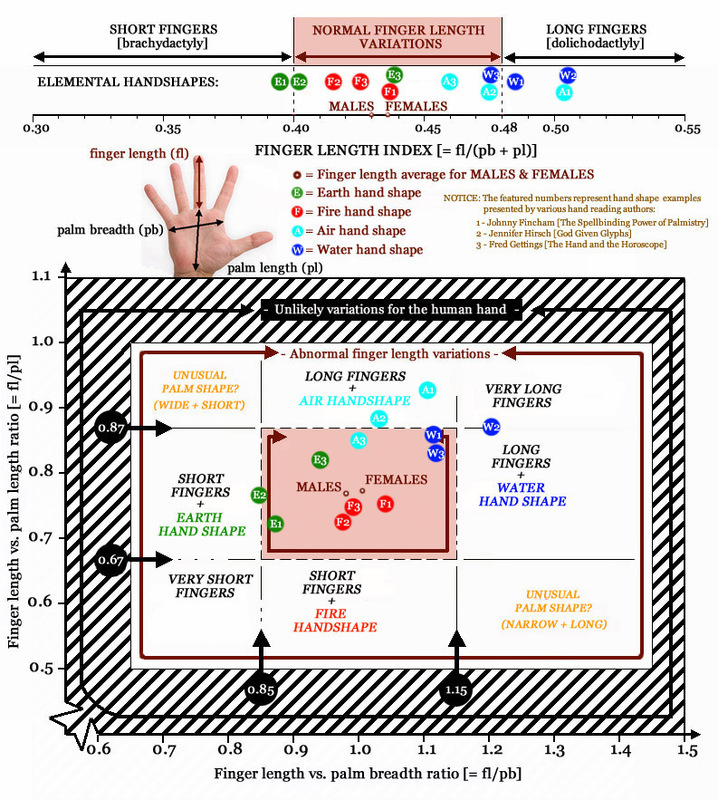 Now back to the words: "finger length is only short relative to the palm breadth": I only meant to relate those words to that specific zone (and not necessarily to all aspects of the three earth hand examples). However, formally I could first add that those words do clearly apply to example E2 (which is positioned just on the left side of the horizontal 0.85 border). And secondly, I could also add that E1, E2 and E3 are all three positioned on the left side of the average values for males and females (the brown dots in the center of the picture). Lynn, I am sort of only trying to present a 'frame work' to describe the key-differences among the 4 groups of hand shapes. And I think only after accepting/understanding the complete 'frame work'... it could indeed make sense to QUESTION the validity of the individual examples that the authors presented! Ok yes I understand what you are saying about how the examples fall on the graph into certain zones. and I understand what you said about "finger length is only short relative to the palm breadth" as pertaining to the group of earth hands plotted in the picture. validity of the individual examples that the authors presented! Although I understand the framework that you are trying to present, I disagree with your above comment, because the framework (or the results) depends on accurate handshapes being plotted on the picture, so I think the first step is to make sure that the hands really ARE those shapes! breaks down because the finger length in the other two examples is long relative to palm length (on my criteria of 85%). Lynn wrote: Ok yes I understand what you are saying about how the examples fall on the graph into certain zones. and I understand what you said about "finger length is only short relative to the palm breadth" as pertaining to the group of earth hands plotted in the picture. Okay Lynn, sounds like a fine start for further discussion so far! Yes, I can understand your argument/requirement above - and to a certain level I kind of agree. - Who is going to decide which description is most accurate? - And who is going to decide if an illustration serves as a valid example for a hand shape? Maybe it requires some reading in the books of all three authors in order to recognize the fundamental problem here: basically, all three authors present different guidelines. Though I am not denying that there are similarities in their approaches/definitions, for me none of the guidelines are sufficiently detailed to find clear results... probably because the attention is too much focused on the palm length - in isolation from the palm width). So... there is the issue of 'hand width' again, that we were already confronted with earlier in this discusson: Fincham and Gettings hardly describe any guidelines for that aspect (though Fincham does mention that in a water hand finger length is required to exceed palm width... which is conform the 'frame work' that I propose). So, yes Lynn, your requirement is valid as well...! However, each of the authors might give you a different answer regarding some of the examples. And please be aware: you are working with a 85% percentage, while Fincham (your collegue in elemental hand reading) uses a significantly higher percentage.... which actually appears to relate to 'abnormally long fingers'!!! So, I am not sure that you and Fincham would agree on all 12 cases, etc. Now, because my fundamental 'frame work' is sort of resulting from the basics of the guidelines presented by the 3 authors... I think it would indeed make an interesting discussion to share our thoughts about individual cases. But it is important here that the 'frame work' is the result of all 12 cases together...! Therefore I think it might not make much sense to consider cases in isolation from the 11 other eleven cases. So, if you find a problem... please try to figure out whether the problem might stand on it's own regarding an individual case, or whether it concerns an issue that is relevant for a significant number of the 12 cases. Does this request from my side make sense? PS. More specific regarding case E3 and W3: Lynn, do you have access to Gettings book? I have not much doubt regarding example W3 being a typical water hand (long finger + narrow/long palm), however... I have doubts about E3 being a typical earth hand (because the fingers are a bit slender and not short at all, though not long either - though the palm shape is for sure squarish). Martijn, would you mind sharing the page numbers of the pages you took your samples? Patti wrote: Martijn, would you mind sharing the page numbers of the pages you took your samples? - Fincham [The Spellbinding Power of Palmistry]: E1 = page 17, W1 = page 19, F1 = page 21, A1 = page 22. - Hirsch [God Given Glyphs]: E2 = page 08, W2 = page 16, F2 = page 24, A2 = page 32. - Gettings [The Hand and the Horoscope]: ... sorry I right now I have only access to the Dutch version of this book, not sure that the numbers are accurate but they always refer to the first illustration in the section for each hand shape: F3 = illustration 102, E3 = illustration 106, A3 = illustration 114, W3 = illustration 122. Martijn, yes Ok I understand what you are saying in your last post & your request. finger length is viewed relative to palm length, but palm width of course is also taken into account for handshape (palm shape = square or rectangular). PS thanks for giving page refs & illustration numbers. Thank you. Gettings illustration 122 is a good sample to show that it's not possible to obtain accurate measurements when the wrist lines are not visible. If you compare the photo of the hand to the ink print below you will see that the ink print ends where the trianglular shape above the center wrist begins. In the photo you can see it's still some distance to the wrist after the start of this triangle, probably at least a centimeter. Gettings describes his method of measuring in his book "The Book of the Hand". Patti wrote: Thank you. Gettings illustration 122 is a good sample to show that it's not possible to obtain accurate measurements when the wrist lines are not visible. If you compare the photo of the hand to the ink print below you will see that the ink print ends where the trianglular shape above the center wrist begins. In the photo you can see it's still some distance to the wrist after the start of this triangle, probably at least a centimeter. yes Patti I also noticed the difference between the photo and the print. From the photo W3 would be fire/water combination hand. I think it is in the wrong place on the picture, finger length vs palm length is less than 80%. Yes Patti, I agree that it is very hard to make a precise measurement when the wrist lines are missing in a print. But I don't think it becomes an essential issue in this matter. By the way, regarding the photo (illustration 121) suggests that the blue W3 in my picture should better be positioned a little bit lower... I think that would have a positive effect regarding the question whether the 'frame work' works or not. PS. One of the reasons why I have used large buttons in this approach is that the exact location of the individual buttons doesn't really matter here. The essential issue here is that this plotting-approach shows how similar hand shapes manifest as a group of buttons in this plotting-approach. And the frame work fundamentally appears to explain why...! Resulting in that I think the 'frame work' itself could potentially turn out to be more important than the issue of where the buttons are exactly positioned. For.... the 'frame work' could sort of itself presents a (new) point of reference regarding the question whether the hands represent a valid representative example for the hand shapes involved! Because the 'frame work' sort of even points out which of the 12 examples are most questionable: I would propose that we should take a closer look at whether examples E3, W1 and F1 were correctly assessed by the authors who presented those examples. Yes, that's correct - I have just pointed this out in my former post as well. But the effect of my mistake does not put much negative effect on the issue of the validity of the 'frame work'. PLEASE NOTICE: I think the photo (illustration 121) even underlines the validity of the 'frame work' (much) better compared to the hand print (illustration 122). I hope this makes sense for both of you as well...? and this alternative proposal for recognizing elemental hand shape. I don't think Johnny says this! (where?) Lines do not have anything to do with recognising hand shape. the lines are a separate thing, nothing to do with hand shape. If you start bringing lines into this you are going to confuse matters. PS. For case W3: based on the photo the finger length vs. palm length is: 0.789, and finger length vs. palm breadth is: 1.10 - that is very close to the letter 's' from the word 'females' in the picture; according the 'frame work' that would be very typical for a water hand. And because the position is inside the 'normal variations' one could add that in this example the 'long finger' are not very long...! PPS. Maybe it is a bit confusing that Fincham starts talking about the hand lines inside his chapter about 'The Elements of Hand Shape'.